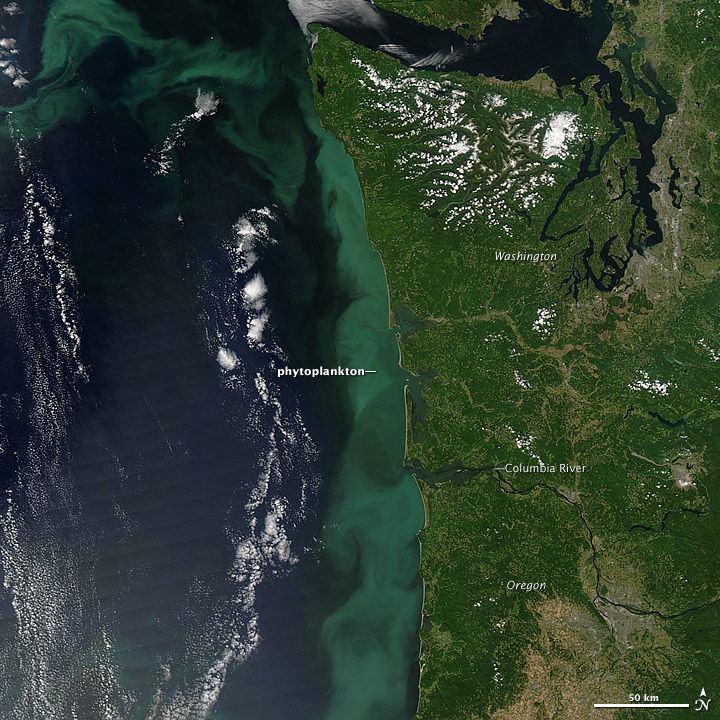 In 2014, a blob of abnormally warm water persisted off the US West Coast. In 2015, tiny marine plants called phytoplankton bloomed and turned the coastal ocean a vibrant green. Then, scientists found alarmingly high levels of toxins in many fishery species like razor clams and green crabs. Animals that were once a popular main dish became avenues for toxins that could damage our brains. To prevent these toxins from rising up the food chain and making humans sick, many fisheries were closed and these animals were kept off our plates. 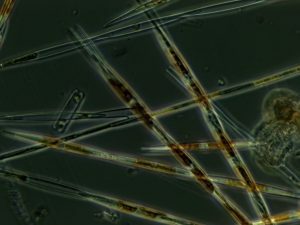 Phytoplankton, like this microscopic species called Pseudo-nitzschia, are so small that they are invisible to the naked eye. During an algae bloom, there can be so many Pseudo-nitzschia individuals in the water that the water appears green, as shown in this satellite image. So, what is the link here? What does ocean temperature have to do with toxins in our food? This is what a we asked middle-school students on the first day of a week-long curriculum. 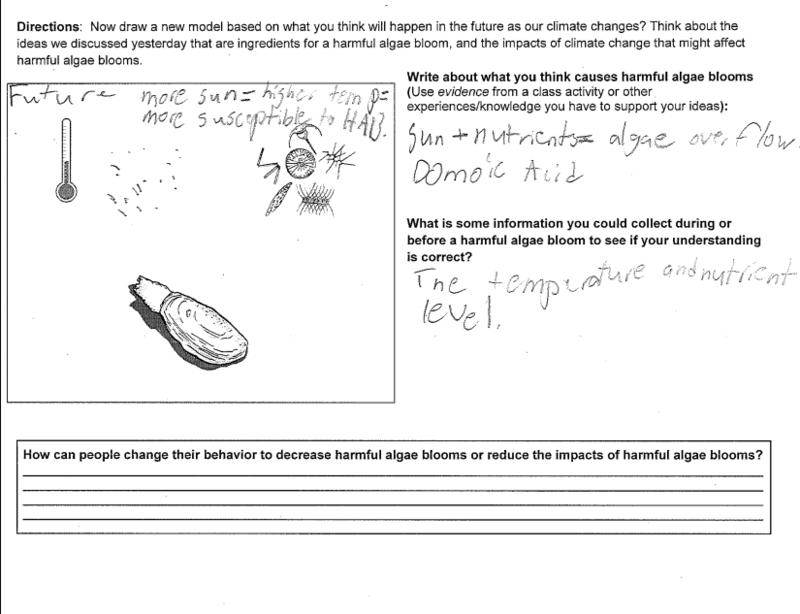 Our goal was for them to understand the many socio-ecological factors that drive algal blooms and then predict how these blooms may develop in a warming climate. Instead of giving them the answer, we asked them to discuss what they already knew and what questions they still had. Then, over the next several days, we approached this phenomenon through several lenses: through games, through biology experiments, through group discussions, and through the actual lenses of microscopes. By the end of the week, the students developed an answer. 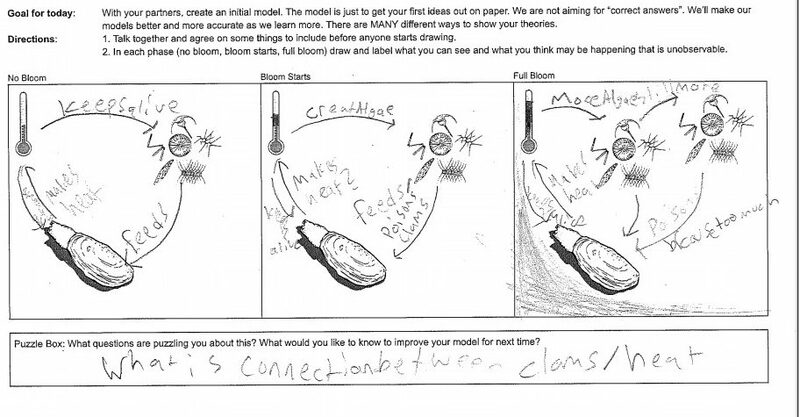 An example of a student’s conceptual diagram on the first day of class. 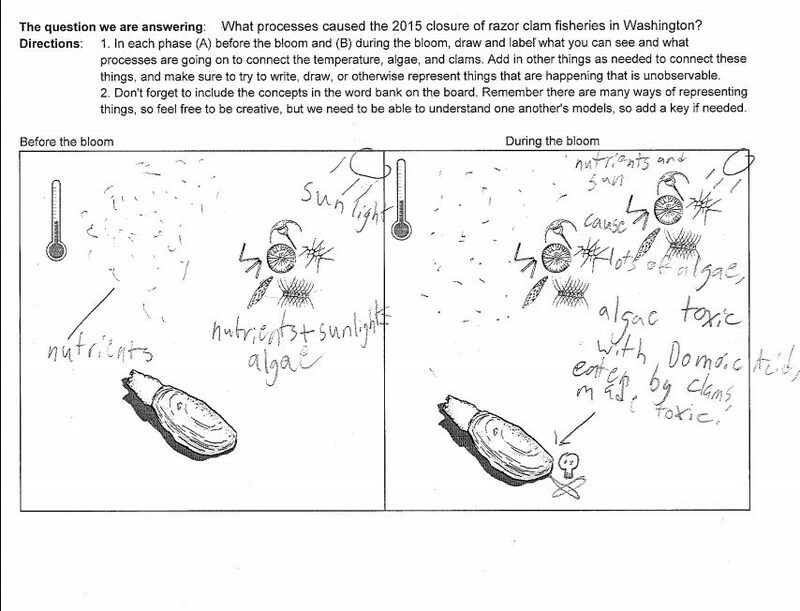 An example of a student’s conceptual diagram on the last day of class. The four UW graduate students that developed and implemented this curriculum as an interdisciplinary team. 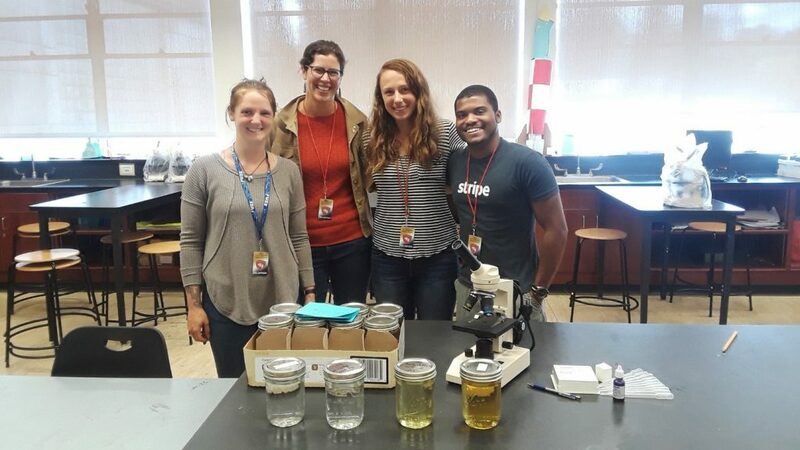 From left to right: Robin McLachlan, Angie Boysen, Christine Baker, Isaiah Bolden. If you would also like to learn from this curriculum and/or teach it to your own students, you can access the teacher packet here. As we have learned, climate science can be made digestible when distilled down to a personal scale. This curriculum is framed around the 2015 HAB off the US West Coast, but it can be easily adapted to a different place and/or time. We hope you can use your own perspective and village of experts to best suite your classroom. This education project satisfies the requirements for Robin McLachlan’s GCeCS capstone.